Earlier versions of the CRM connector supported Breeze sites which contain a single organization (department) structure, and CRM connector support for multiple organizations (departments) within a single Breeze site was not available. The new version of the CRM Connector can now be configured to be used across multiple organisations within the same Breeze site. Each CRM Connector instance can have its own configuration against a unique organization (department). Users will be able to create projects, view projects and view content from Recommended Libraries from different organisations within the SalesForce or Microsoft Dynamics Iframe. A Qorus consultant will use the new CRM connector configuration page to enable this feature across multiple organisations. 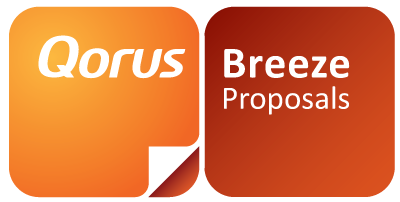 The Qorus consultant will work with the customer to define the field mappings between Microsoft Dynamics/SalesForce and the organisations in their Qorus Breeze Proposals implementation. They will also configure the Project Types and Recommended Libraries for the different organisations where required. The CRM Connector control can be used on multiple organisations. The image below reflects the standard CRM connector implemented on a Breeze Project. The controls on this screen can now be enabled on projects across multiple organizations within the Breeze site. Users can now view and create projects and view content from Recommended Libraries for multiple organisations.